Here is my calculation of the KPR at the end of July, deciding 40 male and 28 female slots (in addition to the Automatic Qualifiers). My results are unofficial, the official results will be posted on the Ironman website at http://eu.ironman.com/triathlon/triathlon-rankings/points-system.aspx (but as far as I can tell will show the same data). I do not count AQs and athletes that haven’t validated in my rankings, therefore it is a bit easier to determine the Top 40 male and Top 28 females. I will update this post with new information regarding declined slots and rolldown. There is going to be another cutoff in August, adding another 10 male and 7 female slots. 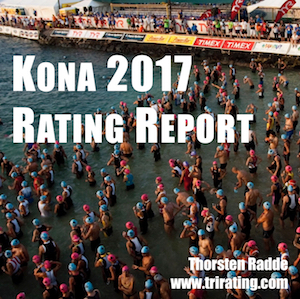 Once the field has been completed, I will work on this year’s version of the Kona Rating Report, looking at the field and each athlete’s chances for a good result. The free report will be released in time before the Kona race, you can already pre-order your copy. July 29th: For now, the tables below contain the athletes that I consider safe for a July slot. The remaining races will decide the final spots, check out the geeky details about who’s currently in and who can still make in this post (“Kona Qualifying Before the Last July Races“). I will update this post as soon as each of the races are over with the implications. July 30th: The Male Rankings are finalized, including the results from both IM Switzerland and 70. Ecuador. Athletes with rankings shown in brackets (such as “(41)”) are out of the slot positions and have to hope for a rolldown slot. For the women, Ironman Canada is likely still changing the rankings, therefore the table for now only shows the athletes that are safe for a July slot. July 31st: With the big points at IM Canada decided, the female ranking is now also finalized in the points slots. As for the men, the athletes shown in brackets (such as “(30)”) are out of the slot positions and have to hope for a rolldown slot. With an expected rolldown from Lucy Gossage, Corinne Abraham would receive a slot even though she’s in #29 and technically just outside the required ranking. August 6th: The anticipated rolldown on the female side has happened: Lucy Gossage has declined her slot which Corinne Abraham accepted. Not all athletes have accepted their slot yet, but there is no other known rolldown. August 7th: On the Ironman website Camilla Pedersen and David Plese are still not shown with a Q, but both have indicated on Instagram that they have accepted their slots. This means that for now there will be no additional rolldown slots.